Philip I (23 May 1052 – 29 July 1108), called the Amorous, was King of the Franks from 1060 to his death. His reign, like that of most of the early Capetians, was extraordinarily long for the time. 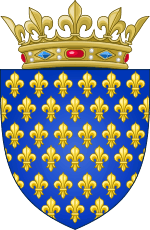 The monarchy began a modest recovery from the low it reached in the reign of his father and he added to the royal demesne the Vexin and Bourges. Philip was born 23 May 1052 at Champagne-et-Fontaine, the son of Henry I and his wife Anne of Kiev. Unusual at the time for Western Europe, his name was of Greek origin, being bestowed upon him by his mother. Although he was crowned king at the age of seven, until age fourteen (1066) his mother acted as regent, the first queen of France ever to do so. Baldwin V of Flanders also acted as co-regent. Following the death of Baldwin VI of Flanders, Robert the Frisian seized Flanders. Baldwin's wife, Richilda requested aid from Philip, who defeated Robert at the battle of Cassel in 1071. Philip appointed Alberic first Constable of France in 1060. A great part of his reign, like his father's, was spent putting down revolts by his power-hungry vassals. In 1077, he made peace with William the Conqueror, who gave up attempting the conquest of Brittany. In 1082, Philip I expanded his demesne with the annexation of the Vexin. Then in 1100, he took control of Bourges. ↑ Authority, the Family, and the Dead in Late Medieval France, Elizabeth A. R. Brown, French Historical Studies, Vol. 16, No. 4 (Autumn, 1990), 807. 1 2 3 Elizabeth Hallam, Capetian France: 987-1328, (Longman Group Ltd, 1980), 50-51. ↑ Jim Bradbury, The Capetians: The History of a Dynasty, (Bloomsbury Publishing, 2007), 111. ↑ Jim Bradbury, The Capetians: The History of a Dynasty, 114. 1 2 Jim Bradbury, The Capetians: The History of a Dynasty, 119. ↑ Robert Somerville, Pope Urban II's Council of Piacenza, (Oxford University Press, 2011), 118. ↑ Philip I of France and Bertrade, Dissolving Royal Marriages: A Documentary History, 860–1600, ed. David d'Avray, (Cambridge University Press, 2014), 47. ↑ Christof Rolker, Canon Law and the Letters of Ivo of Chartres, (Cambridge University Press, 2009), 16. ↑ C. Petit-Dutaillis, The Feudal Monarchy in France and England:From the 10th to the 13th Century, transl. E.D. Hunt, (Routledge, 1936), 81. ↑ Nicholas L. Paul, To Follow in Their Footsteps: The Crusades and Family Memory in the High Middle Ages, (Cornell University Press, 2012), 38. 1 2 Richard Huscroft, Tales from the Long Twelfth Century: The Rise and Fall of the Angevin Empire, (Yale University Press, 2016), xi. ↑ Daniel Power, The Norman Frontier in the Twelfth and Early Thirteenth Centuries, (Cambridge University Press, 2004), 85. ↑ Jim Bradbury, The Capetians: The History of a Dynasty, 131.